Aplus Finetek Sensor, Inc. is pleased to announce the availability of its newest product line, the EB5 Series RF Admittance Level Transmitter for use in measuring the continuously changing level of granular, freely flowing powders and liquids in a variety of industrial applications. The EB5 is a state-of-the-art level sensor including a 4-20mA 2-wire design which uses 24VDC loop power. 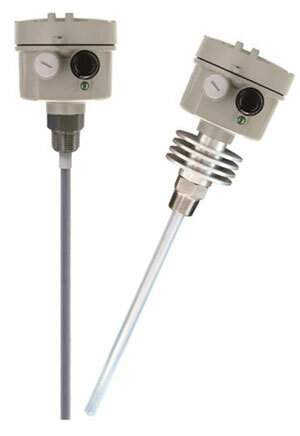 The EB5 series level transmitter uses RF admittance technology to continuously measure the changing impedance between the sensor probe and the vessel metal wall. A solid rod probe, cable probe, two-rod probe and anti-wave tube type probe are available to allow the EB5 continuous level transmitter to be used in a wide variety of level measuring applications in many industries. High temperature and explosionproof versions are available. The EB5 can be provided for use with operating temperatures up to 392⁰F (200⁰C). The EB5 series level transmitter is easily installed with a simple 2-point calibration, has excellent sensitivity and a very low temperature effect. In addition, a wide variety of process connections is available, both threaded and flanged. The EB5 series level transmitter can be combined with Aplus Finetek’s PB and PM series digital indicators and bargraph displays with or without relay outputs. The PM and PB series will provide the loop power to the EB5 units over the 2-wire 4-20mA output. For more information look at our EB5 Series product page and contact Aplus Finetek Sensor, Inc. at 815-632-3132 or email us at info@aplusfine.com.